Tomorrow is election day for several Wake County school board positions in Raleigh, North Carolina. Living in the area, I of course received voter guides and similar flyers on who to vote for. One page size mailer stood out though and it wasn’t pushing any one candidate. Apparently, I can stop the Tea Party… and I don’t even have to get off my couch to do it. Paid for by the NC Futures Action Fund. It was a PAC or 527. I googled it and found that I wasn’t the only one getting this mailer and that it was the same group running ads trying to link current board members to the Tea Party using the whole ‘extremist’ angle of course. You might remember the hit piece they did with matching website called ‘Queen of Extreme‘. 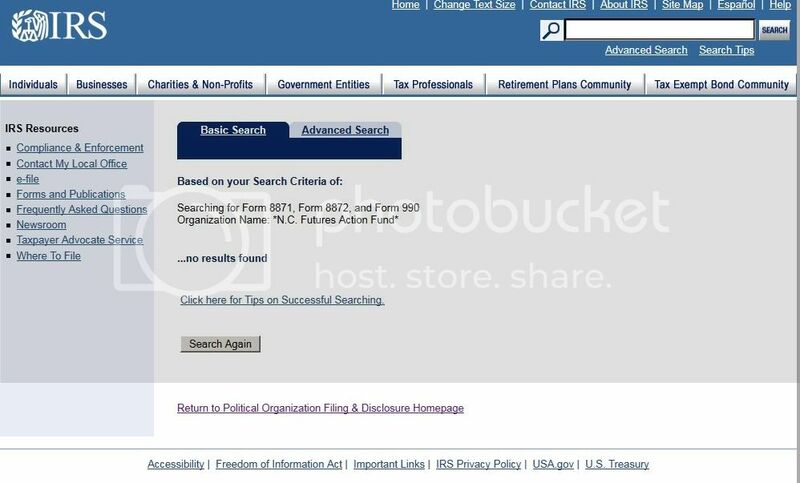 I checked out NC Futures with the IRS and found it didn’t exist. I got a lead from another story I found that linked NC Futures to two other PAC’s – Common Sense Matters and Fired Up and Ready To Go. These are just the ones I could locate, I have a feeling there are others. I am still tracking down information on Progress NC Action fund, which I believe to also be linked to Common Sense Matters. Common Sense Matters was filed with the IRS by Michael Schierbeek, CPA. Also tied to Common Sense Matters are Alan King, COO of Workplace Options, Scott Falmlen, Former Democratic Party Exec. Director for NC and Political Consultant for Nexus Strategies and Former Democratic Candidate for Treasurer, Michael Weisel. It is worth noting Falmlen ran campaigns for both Former Governor Easley and did some work for the current Governor, Bev Perdue. NC Tea also looked into Falmlen – they concluded he was a ‘Dem Hitman’. That would be accurate given Erskine Bowles and the Dem party had to pull a misleading ad that Falmlen engineered. Turns out he’s got a checkered past and those who dug into his background when he was running Alliance for NC got an eyeful. I guess it is no accident he was named to the Democratic Convention committee given his political mojo to date. Read more here on the latest round of mailers at the News and Observer. I’ll be voting tomorrow and not from my couch via absentee ballot either. The mailer didn’t alter my voting selection. If anything it confirmed and solidified it. Now that I’ve written this piece I can throw that slimy thing in the recycling bin — an apt place for it, since it seems the Democratic Party in NC keeps trying the same tired tricks every year. This entry was posted in LL1885, Tea Party, The Articles and tagged 527, Falmlen, King, NC Democrats, NC Futures, PAC, Wake County School Board, Weisel. Bookmark the permalink. 2 Responses to PAC Attack!! !